I dragged all of my shoes out of the depths of my wardrobes and decided to make a shoe tower. Easier access, better ability to see what I had, a lovely choice of which to wear before I go out. But but… after I did it, there was a messy pile of shoe boxes against the wall. It offended my sense of aesthetics, it was completely unacceptable!! 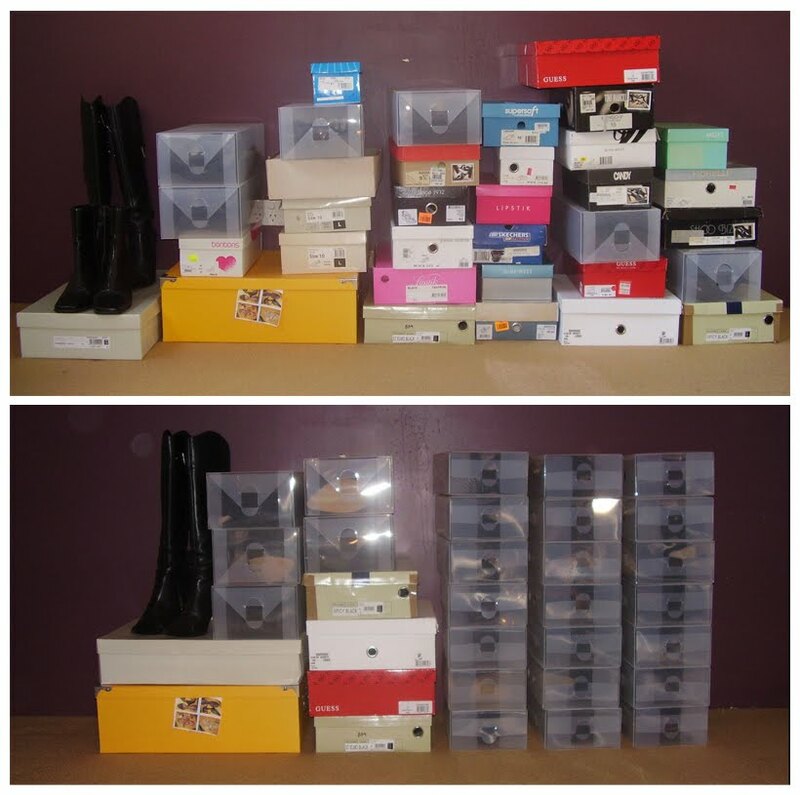 So, I ordered clear shoe boxes to put them all in, to make them pretty, you know I like the pretty. I know, I know… you thought that I would have more shoes, right?! Me too! It’s not right is it? It’s a paltry tower… more like a ‘towerlet’. We need a realistic standard of comparison. How long did it take to build Italy? I'm sorry, I had you blog confused with Ferns' blog. I know that Ms. Ferns would have had not just a closet, but an entire room devoted to her shoe collection. Pffftt… there is no rationalising a paltry number of shoes when you are a self proclaimed shoe whore! I don't deserve the name, I am really just a shoe whore wannabe!! Well, you can clearly see now that I am a liar and a fake and a flake! Offers from strangers to supplement my paltry shoe towerlet, to create the grand and imposing tower it *should* be will be seriously considered. See, I'm in your head! Scary isn't it? True… quality is important, and I resolve to work on the quantity problem! !